Osteopathy – Do you or your family suffer from back pain, neck pain, joint pain, muscle pain, arthritis pain, frozen shoulder, injury or other health problems? Or do you struggle with stress, tension or anxiety? Maybe you have weight, obesity, overweight, habits, phobias, fears, relationship problems, want to stop smoking or quit smoking? Our experienced therapists want to get you back to normal as fast as possible – so you can return to work, sports and daily tasks with the minimum of fuss. We will explain what is wrong with you in words you can understand, what we can do about it and any other ways to treat it. Osteopathy and more – Our team of experts help you recover from back pain and other health problems as naturally as possible – hence our motto, “Pain Relief Without Drugs”. Find us in Grays town centre, near the Library and Registry Office. It’s a quiet, calm healing oasis in the middle of town. We serve the South Essex area. That includes Grays, Badgers Dene, Chafford Hundred, Tilbury, Chadwell-St-Mary. Stifford, Orsett, Horndon, Ockendon, Aveley, Purfleet, Thurrock, Bulphan, Rainham. Basildon, Linford, Mucking, Corringham and Stanford-le-Hope. Our clinic was set up by local osteopath Peter Still in 1993. It has a great reputation with the local community, doctors and other healthcare professionals. We get referrals from GPs, minor injury units, insurance companies, injury management companies, solicitors and local businesses – but you don’t have to be referred, you can just call to make an appointment. Be assured, we have your welfare at heart. We will give you time to explain the problem that has brought you, help you explore the causes of your health issues and form a treatment plan to speed up your recovery. Many of our treatments are suitable for all ages, from babies to elderly. We promise that we won’t make false “discount” offers or sign you up for a long course of treatment that you don’t need or can’t afford. Treatments available – tap on them to find out more! Osteopathy for low back pain, neck pain, joint pain, arthritis pain. Sports injuries, RTA injuries, frozen shoulder, knee, shoulder, hip, wrist, ankle, foot. Tennis elbow, golfers elbow, shin splints, heel spurs, headaches, vertigo. Trapped nerves, sciatica, numbness, pins and needles, pain during pregnancy or after childbirth. Nutritional Therapy / Naturopathy addresses health issues by looking at your diet and lifestyle, helping you understand how these factors can influence your wellbeing and guiding you into better choices, tailored to your lifestyle. Reflexology and massage for stress, tension, relaxation and general well-being. Counselling for relationship problems, separation and divorce, bereavement, marriage preparation, anxiety, depression, post-abortion distress, abuse and trauma. Weight Control Plans with Yvonne for weight control, weight loss, slimming, obesity, overweight. Provides low carb meal replacements to help you achieve and maintain your ideal weight. Applied Kinesiology is a system of muscle tests that direct the therapist’s attention to different systems in the body that may be functioning poorly. We also supply a range of back supports, pillows and nutritional supplements. Complementary medicine is directed at the person, not the disease – so your therapist will ask a wide range of questions about your health and lifestyle. This helps them work out the best way to treat you. Our job is to help your body recover from injuries, diseases or other issues in the best way possible without trying to mask the symptoms or over-ride your body’s natural healing process with drugs. We don’t recommend you stop taking important medication for conditions such as diabetes, heart complaints etc. but you may find that you rely less on painkillers, laxatives or other over-the-counter remedies when using complementary medicine. All our therapists are fully trained, registered with the appropriate bodies and insured. They undergo regular updates of their skills through lectures, additional courses and self-guided study. We are happy to receive referrals from your GP, health visitor, midwife or any other healthcare professional. Osteopaths are widely recognised by most doctors as back pain specialists. We can also work with employees that want to use osteopathy or other treatments to help their employees return to work faster. Some of the therapies listed may not be available at the moment, whilst other new treatments may be included at the clinic. Give us a call 0n 01375 396402 for up-to-date details. If you are a therapist looking for professional treatment rooms then give us a call. Our opening hours vary – different therapists work different days. Some treatments are available evenings or weekends. We try to answer calls from 8am to 8pm any day but please don’t be afraid to leave a message if we don’t pick up. Osteopathy appointments are usually available within 3 working days. Back pain, neck pain, arthritis, joint pain, headache, migraine, sciatica, tension, stress. Relax, relaxation, frozen shoulder, knee pain, shoulder pain, hip pain, rib pain, osteopath. Osteopathy, chiropractor, chiropractic, physio, physiotherapy, physiotherapist. Foot pain, wrist pain, tennis elbow, golfers elbow, stop smoking, quit smoking. Fears, phobias, anxiety, relationship issues, fear of flying, fear of heights, vertigo. Habits, claustrophobia, agoraphobia, massage, indian head massage, no hands massage. Slipped disc, prolapsed disc, bulging disc, herniated disc. You might have mis-spelt my name – Peter Steele, Peter Steel, Peter Style, Peter Styles are all wrong! It’s Peter Still, registered osteopath. Or you could be trying to contact Yvonne Fernsides or Evonne Furnsides or Yvone Firnsides – you mean Yvonne Fearnsides! I have been treated by Peter for over a decade. I have recurring back problem caused by an injury many years ago. He is the only osteopath that quickly and easily gets me mobile and pain free. I moved away from Grays many years ago but still go back to Peter as his expert treatment for my back is unmatched by other osteopaths that I have tried locally. Absolutely amazing results with the cranial osteopath Peter. We took our 5 month old baby boy who was struggling with wind and silent reflux-he was not sleeping due to the wind and was screaming in pain all the time. We tried everything...infacol, probiotics, colief, gripe water and even colic calm. Desperate to help our boy we decided to give this a try. After the first session we saw great results-he started sleeping for longer at night (from just an hour and a half to up to 5 hours) and being less windy. Now after 3 sessions he's a much happier baby and so are we! Would definitely recommend for colicky and reflux babies. (Editor's note - at present there isn't firm evidence for using cranial osteopathy for infantile colic and reflux - however as this parent has said, it appears that many children do benefit). Can recommend Peter, he has got me back on my feet a few times now. Grays Complementary Clinic is easy to contact as they usually answer calls quickly in the day or evening. They fit you in within a day or two and tell you what has caused the problem and how to stop it happening again. Well I had my first visit yesterday, a bit apprehensive ,but I could hardly stand straight and I was very bent over when getting out of the car or chair, then it hurt to stand upright, the pain was terrible.. I told Peter and he worked on my back and massaged the area which was quite intense .but it worked and this morning when I got up I was upright, my Mum couldn't believe I was walking so good and neither can I .. Gosh wish I went to him when this first started a year ago.. Thank You so much... The pain was hardly there either, and didn't have to pop pain killers. Thank you. I came to you with knee pain but you diagnosed a hip problem. The exercise you gave me helped and the consultant told me I recovered from my hip replacement operation three weeks faster than his other patients, as I'd done the exercises! Dear Peter, Thankyou very much for the treatment you helped me with recently. It eased the muscle pain and the neck exercise is inspired! Am also doing the lower back exercise. I've realised that the 'right' exercises are what are needed. 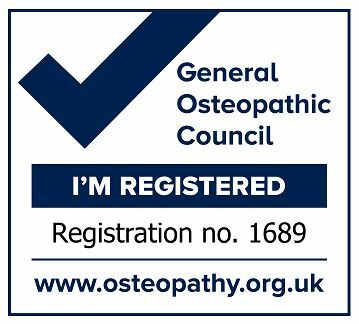 My doctor said I would have to live with the pain but the osteopathy treatment has made a world of difference to my life - I can now do everything that I used to do when I was younger. Testimonial - You always work miracles whenever I come to you! (This patient has attended occasionally since 2002). I came to you years ago!! You helped me and I have never needed to see you for my neck again . But I still do the stretches you recommended every day - Thankyou. ... I often mention you to others. And you taught me to recognise the early warning signs and stretching every day prevents my neck from locking up at its worse. You have helped me so much. Thank you. For a few days I was suffering from Vertigo and this was really making me feel depressed. I remembered that I had visited Peter Still in the past and thought he may be able to help me with this problem. I was lucky had he could see me the next day and said he thought he help with the problem. He explained what the problem was and told me how he could help. I was very happy to go ahead as I thought anything to improve my Vertigo was worth trying. After my course of treatment, I had improved 90%. I went the following week for another session and Peter explained the problem may come back after some time, I informed him that I would come back as I know he would all he could to make me feel better. I would definitely recommend Peter Still to anyone who is suffering with this sort of problem. Peter is a thorough and highly skilled osteopath who always makes you feel at ease. I have visited him several times when in extreme pain and always left his practice the better for it. I would highly recommend his services to anyone needing pain relief, and ongoing care for back and neck problems. The excercises you gave me are a life saver - I do them when I get up and before walking the dog every day. Before I felt like I was disabled, now I can walk normally. Regular client of Peter Still since he came in practice. N.H.S. have done nothing for me. Have worked in construction whilst having regular treatments to keep me going to work. M said thank you for all your help and advice you always give him. I have an MOT every 6 weeks which identifies and deals with any minor problems before they might become major issues. Excercises are always helpful and providing they are done regularly, rather than rigourously, they keep me mobile and fit. These visits are worth every penny! Both (my husband) and I have been attending your clinic for many years. We both find the treatment very effective; I could not walk having a bad knee. Peter soon got me walking again, and (my husband) had an accident at work, hurt his back and Peter has kept this from getting worse. He feels a lot of benefit from the treatment he is given. We can get through to you any time and all of you are always there to help. Always very pleasant to talk to and hope to be able to attend your clinic for a few more years. I came to Peter not being able to walk or stand without holding myself up. My condition (severe back and leg pain) was causing me sever pain and was affecting my working life considerably. After five weeks of treatment I was fully mobile and active, and now eight weeks later I am leading a fully active life and playing squash again! Thanks Peter.